Randy Pullen and Michael Coringrato recently visited with CCNG members at the Phoenix, AZ Optimize event to discuss compensation and how to best determine comparative rates for your contact center operation, regardless of location, vertical or size. Listen to this webcast and learn how WageWatch can help you compare wages for home-based agents to facility-based agents. Competition for key talent will be at its highest levels since 2008 and your competitors will be giving the largest wage increases in several years. Now is the time to review where your pay practices, incentives, and merit pay ranks in the marketplace. Want to? We have the data that counts for 85 job titles. You’re clicks away from accessing the most comprehensive compensation market research in the industry. 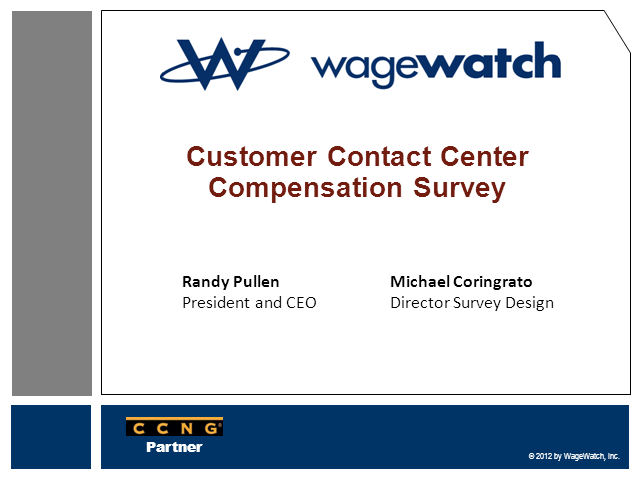 WageWatch announces its 2012 Customer Contact Compensation Survey is now open, see WageWatch.com for details.